The rain gods came to the rescue of the hosts in the last game. Australia was reeling after India restricted them to 132/7 in the first innings. But the persistent rain didn’t allow India’s chase to begin. As a result, the match was abandoned and Australia maintained the 1-0 lead. It’s now down to the last match of the series. 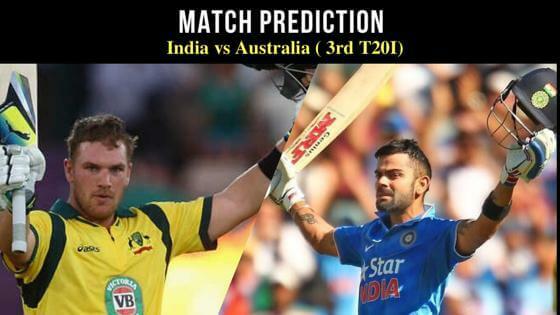 Keep reading to find out the India vs Australia 3rd T20 Match Prediction. After the loss in the first match, Virat Kohli stayed with the decision to bowl first after winning the toss. The bowlers did a much better job in Melbourne. Every single bowler chipped in with wickets. Apart from Khaleel Ahmed, every other bowler conceded around 6 an over. The Men in Blue would be hoping for a repeat of that in Sydney. On the other hand, unlike the first match, the Australia batsmen struggled. A few of them began well but none carried on to make a big one. The likes of D’Arcy Short, Chris Lynn and Glenn Maxwell reached double digits and got out. For Australia, it’s a chance to wrap up the series 2-0 but the visitors would be hunting to level. India vs Australia 3rd T20 Match Prediction: After a spirited performance with the bowl, Virat Kohli and his men would be pumped up. The momentum is with India which makes them favorites to level the series.